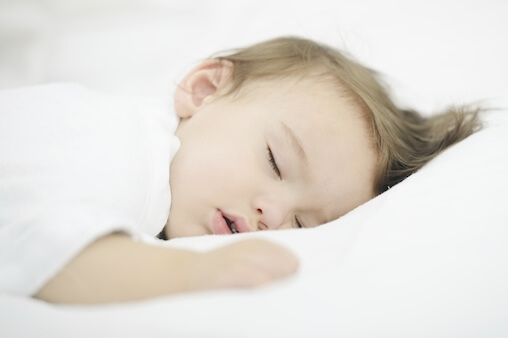 How your children sleep may change their body composition – their lean body mass, total body fat, abdominal fat, and waist and hip circumference. A fascinating new study showed tight links between kids’ not getting enough sleep as babies, toddlers, and preschoolers and becoming obese by age 7. Researchers at Harvard’s Mass General Hospital followed more than a thousand children from 6 months old until they were 7. Their results, from the longest sleep study of its kind, were published in June 2014. They defined insufficient sleep at less than 12 hours per day for kids 6 months old to 2 years old, less than 10 hours a day for 3 and 4 year olds, and less than 9 hours a day for 5 through 7 year olds. Based on these criteria, kids who were most sleep-deprived over time averaged the highest total fat, the highest abdominal fat, the highest weight, and the highest BMI by the time they were 7. The effect was not small. Those who had the lowest sleep scores from 6 months old to 7 years had an average BMI that was 48% higher than the kids with the highest scores. They were more than twice as likely (2.62 times as likely) to become obese. Many studies have shown that kids today are sleeping an average of 30 to 60 minutes less per day than they used to. The authors of this study conclude that improving this statistic could be a practical, achievable way to reduce obesity and improve kids’ body composition. Aim for a consistent bedtime. Avoid caffeinated beverages for young kids, especially after lunch. Avoid the wrong wavelengths of artificial light after sunset. Remove distracting display screens from kids’ bedrooms. Good sleep is central to good health – and to a thriving mind and body. Providing kids a good nighttime environment is a powerful, lasting gift. Taveras EM, Gillman, MW, Peña MM, Redline SL, Rifas-Shiman SL. Chronic Sleep Curtailment and Adiposity. Pediatrics. Jun 2014. 133;1013. NOTE: Dr. Greene is on the Scientific Advisory Board of Lighting Science.